Total productive maintenance (TPM) is a new way of looking at maintenance, or conversely, a reversion to old ways but on a mass scale. In TPM the machine operator performs much, and sometimes all, of the routine maintenance tasks themselves. This auto-maintenance ensures appropriate and effective efforts are expended since the machine is wholly the domain of one person or team. 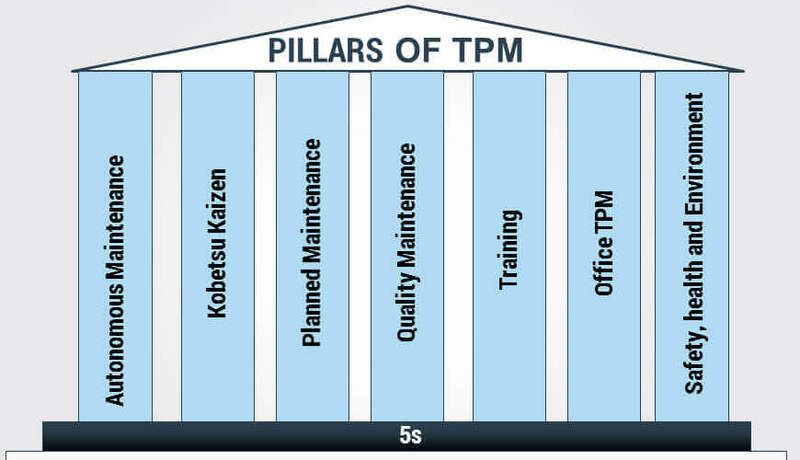 TPM is a critical adjunct to lean manufacturing. If machine uptime is not predictable and if process capability is not sustained, the process must keep extra stocks to buffer against this uncertainty and flow through the process will be interrupted. One way to think of TPM is "deterioration prevention" and "maintenance reduction", not fixing machines. For this reason many people refer to TPM as "total productive manufacturing" or "total process management". TPM is a proactive approach that essentially aims to prevent any kind of slack before occurrence. TPM’s motto is "zero error, zero work-related accident, and zero loss". Increase productivity and OPE (Overall Plant Efficiency).